Most martial artists have at lest a basic knowledge of the more well-known weapons of Okinawa. Surprisingly, however there is a vast array of weapons virtually unheard of in the West. The work "kobudo" means "ancient weapons way". In this article the author's focus will be on some of the lesser-known weapons of Okinawan Kobudo. Okinawan kobudo had its start around 400 years ago when Japan began to assert control over the Island of Okinawa. One of the edicts forced the Okinawan people to turn over their weapons to the Japanese. The move was made by Imperial Japanese leaders with almost no realistic political foresight and very little insight or perception into the Okinawan way of thinking. The ruling classes assumed that to gain political and financial control over this tenacious island race, all that was necessary was to disarm the people. The edict specifically ordered that "all weapons" be turned over to the authorities. Little did the authorities realize that the Okinawan people were such a nationalistic race and so strongly devoted to freedom that they would go to any lengths to deceive and/or hide the weapons they needed to fight their oppressors. Thus, weapons were called "farm implements", but underground the fighting population was training in the use and proficiency of these tools. Soon the weapons masters became a most feared force in the battle for political freedom, feared by the Japanese and idolized by the Okinawan people whose protectorate they were. This was the birth of what we now know as Okinawan Kobudo. Detailed presentations on the history, basic and advanced techniques for each of the above weapons have been extensively written about by this author and others over the years and thus will not be the focus of this article. A brief introduction to each of these lesser-known weapons is presented in the following paragraphs. In addition, the photo sets which accompany this article demonstrate selected typical applications of some of the weapons in a combat situation. 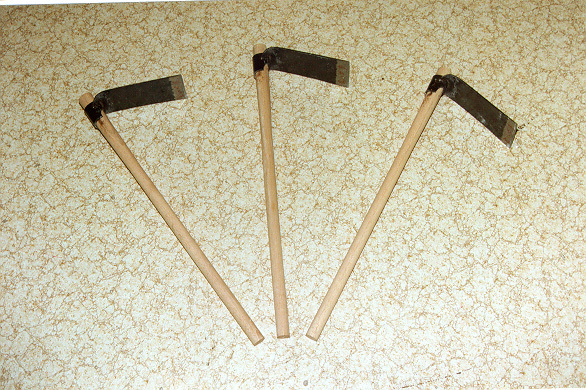 The Kuwa or wooden hoe is another minor weapon which is not often seen even in the most traditional of the kobudo schools. Probably the most noted practitioner of this weapon keeping the tradition alive was the late Shinpo Matayoshi. It is not the purpose of this article to present one or more traditional weapons kata for the reader, as it is the authors strong opinion that kata can not be correctly learned via a set of photographs. For a student to really "learn" the kata, direct instruction by a teacher is required. However, an article such as this can be an excellent vehicle to present an overview of the historical and technical principles involved with the lesser-known weapons of Okinawan Kobudo. The viewpoints and techniques expressed herein come from the teachings of Kyoshi Heilman and his teacher Master Seikichi Odo and the Okinawa Kenpo Karate-Kobudo system. Master Odo, a practitioner of the arts for over 54 years was one of the first of the Okinawan masters to formally incorporate a complete system of weapons into a traditional karate system. The "Odo Lineage" kobudo continues the teachings of some of the top current and past kobudo practitioners including: Kakazu. Matayoshi, Toma, Meazato, Kinjo, Kyan, Kuniyoshi and Sakiyama. 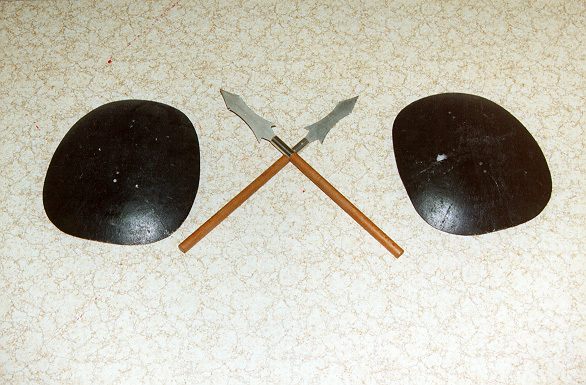 The above photos show some of the lesser known weapons of Okinawan Kobudo. 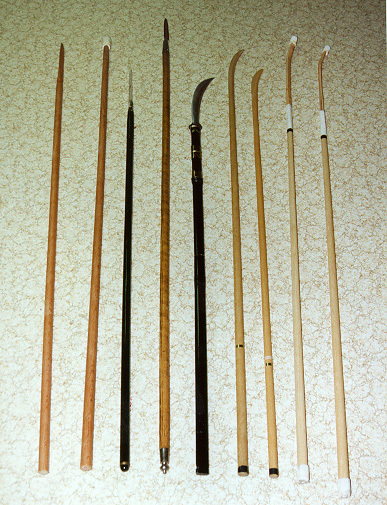 Included are various bo, yari bo, and naginata, various types of tekkos, tinbe and rochin and kuwa.